When we first arrived at this location early in December I was pleased to discover a pair of Great Horned Owls. They didn’t show up every night but often enough for me to keep a daily watch for them. Sometime late in January we didn’t see them very often and I figured they were off nesting. Late at night we’d hear the hooting and now and then we’d spot one them in a tree or on the wire by the road. 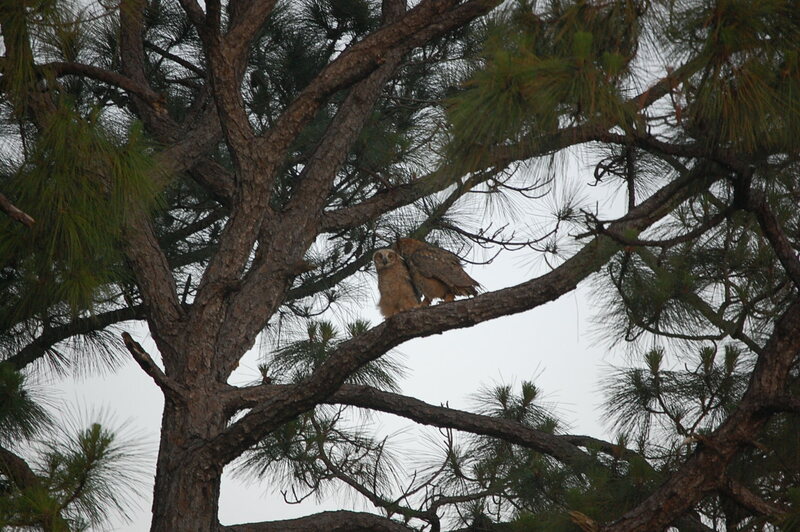 A few days ago I spotted these two in the pine tree and the adult was grooming the owlet. Yesterday I saw two adults and the baby, I assume it’s the family unit.